When I was at the lake a few weeks ago we happened into a little shop that sold items made by Stonewall Kitchen. My favorite thing about this shop was that they had samples out so you could taste the products. Seriously, if you hung around long enough you could make a meal out of it. Needless to say we “tested” just about everything! Once I tasted this jam there was no doubt it was coming home with me. Alongside all the samples were recipes for dishes that are made with Stonewall Kitchen products. 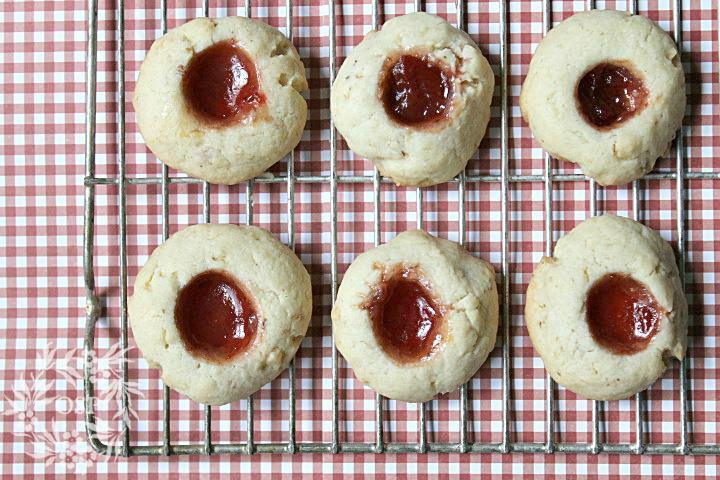 The recipe that goes along with the jam is Thumbprint Cookies. These were easy peasy and really sort of fun. They would be great to make with kids. Instead of using the end of a spatula (like I did) to make the “thumbprint,” your kids could actually use their thumbs. The dough calls for crushed walnuts. I roasted mine a bit before I ground them. They add so much flavor and texture to the dough. 1 c. butter at room temp. In the bowl of a standing mixer cream the butter and sugar until fluffy. Add egg, egg yolk and vanilla one at a time. Add to butter mixture slowly, mixing well between additions. Put out on to wax paper and knead a few times. Wrap up and refrigerate at least 1 hour. Roll dough into one inch balls and drop onto cookie sheet. Make indentation in each ball with the end of a spatula or your thumb. Drop 1/2 t. jam into each hole. Bake 13 – 15 min. Let rest on cookie sheet for 5 minutes. I put a patriotic spin on these and they could be used for the 4th of July or Labor Day. They would be great during the holiday season too. I’m not being paid or endorsed in any way by Stonewall Kitchen. I thought these looked good and I wanted to try something new. I like the way they turned out and they taste wonderful…and I should know because I ate several along the way! Give them a try if you have kids or grandkids. You’ll have fun. Promise. These look scrumptious and so cute. Pinning! Visiting from Fox Hollow’s pin party. Yummy Ann, they look delicious. That jam looks so good. It’s been a while since I’ve made jam, now I’m encouraged to make some and to bake cookies. My waistline wont thank me LOL. You know I’ll be making these for sure! I love that you used sour cherry jam! It is my favorite!!!! 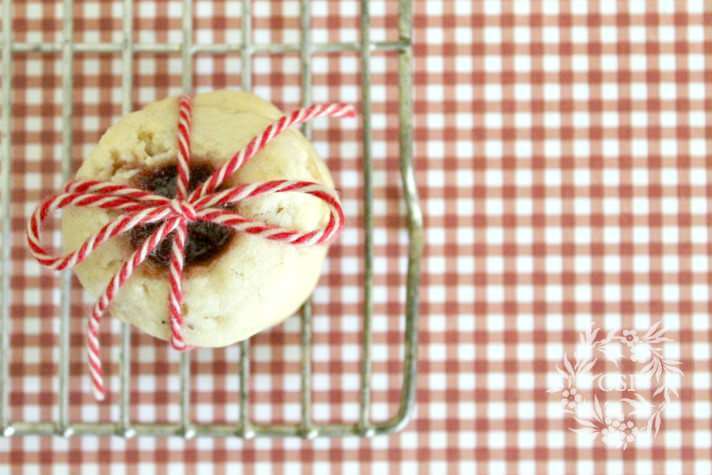 Thank you so much for joining TUTORIALS TIPS AND TIDBITS with your yummy sweet treat! I know these must be delicious and you display them so beautifully! Oh…My goodness! Your thumbprint cookies look sooooo good! What a delightful tutorial and recipe. I love that you have added ground walnuts…Such a great addition for texture and flavor! I like the contrast between sweet and sour that you have given your cookies with sour cherries. I look forward to making some up when the weather cools a bit. Thank you so much for sharing, my friend. I’ve never done thumbprint cookies before. I am now inspired. Thanks. YUM!!! I keep forgetting that this weekend is Labor Day. Gorgeous cookies…I love all of the Stonewall Kitchen products and the sour cherry is my favorite! Thanks for the great recipe! Such pretty cookies. My mother makes something similar but I’ve never made them. They look so good! Ann, your cookies look so good! I make some similar ones at Christmas, but I use pecans and strawberry jelly. One of the grandgirls may be coming to visit this weekend, so I may make some of these with her. I wish I had one of these right now! I’ve made a similar cookie before, but the walnuts got rolled along the outside of the cookie. I think I would like your version better. Thanks for sharing. I’ll be trying these soon. I want one. I love thumbprint cookies. I’ll plan this for a baking time with my grandson. Thanks, Ann. Oh Ann, These look so yummy. I never seen sour cherry but love the Stonewall products. Thanks for sharing. Hope you are enjoying your week. I love when I come upon a shop that carries Stonewall products! 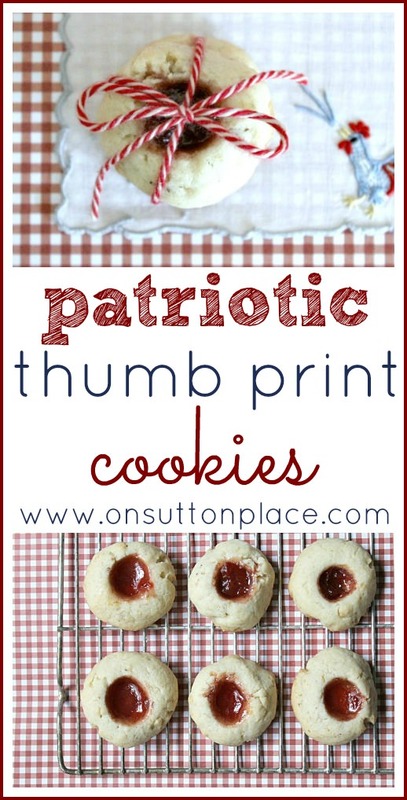 What a great idea for the jam…my mom used to make thumbprint cookies all the time. Thanks for sharing the recipe! I make thumbprint cookies for my husband- his absolute favorite. Yours look delish, haven’t made them in months, need to do so – I always use raspberry jam. Never tried cherry, looks yummy. Love Stonewall products. What fun Ann. Your photos are pretty too. I love these! And, I just say, the way you presented them is also very pleasing to the eye as well! I haven’t made these since the children were little. They were so good with a cup of tea – just the right size!